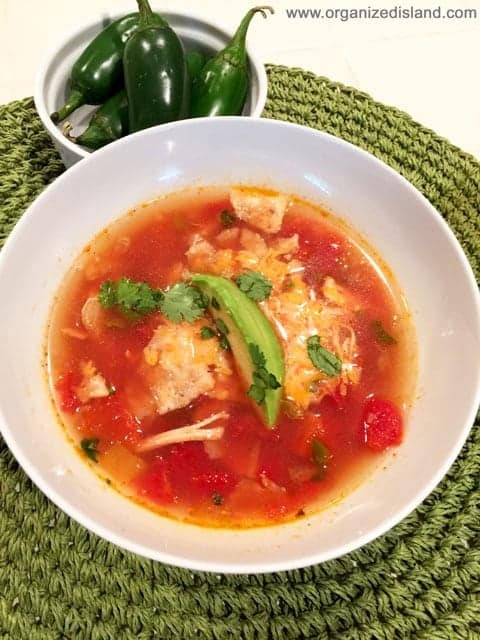 This simple Chicken Tortilla Soup recipe is a really great meal that comes together quickly. Hello Friends! It is a great time to make some soup for a meal. 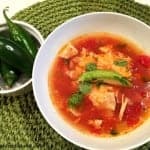 This homemade Tortilla Soup recipe comes together easily with flavors of chicken, tortillas, and vegetables, for a wonderful hot meal. It is a perfect winter soup as it is very comforting too. I usually make it by using a rotisserie chicken to save some time, but it can be made with baked chicken breasts or leftover cooked chicken. If you like your soup spicy, you can add a little more chili powder, or 1/4 teaspoon of jalapenos. I would recommend that you taste it first so that it has just the right about of spice you like. 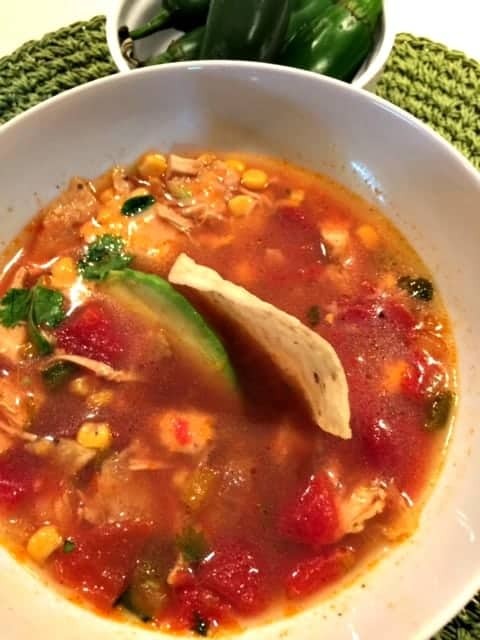 This Easy Chicken Tortilla Soup Recipe is great for chilly days and evenings. You can make it mild or spicy. In a pot over medium heat, add all ingredients and heat until boiling. reduce heat, over and simmer 20 minutes to allow flavors to combine. Serve with tortilla chips, cheese and avocado if desired. Use rotisserie chicken if you do not have the time to make or defrost cooked chicken breasts. 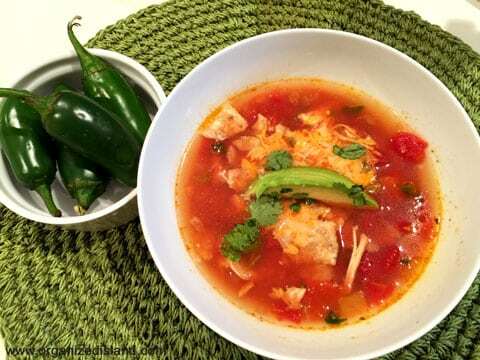 Chop up the bell peppers ahead of time and store in the oven until ready to make this soup. 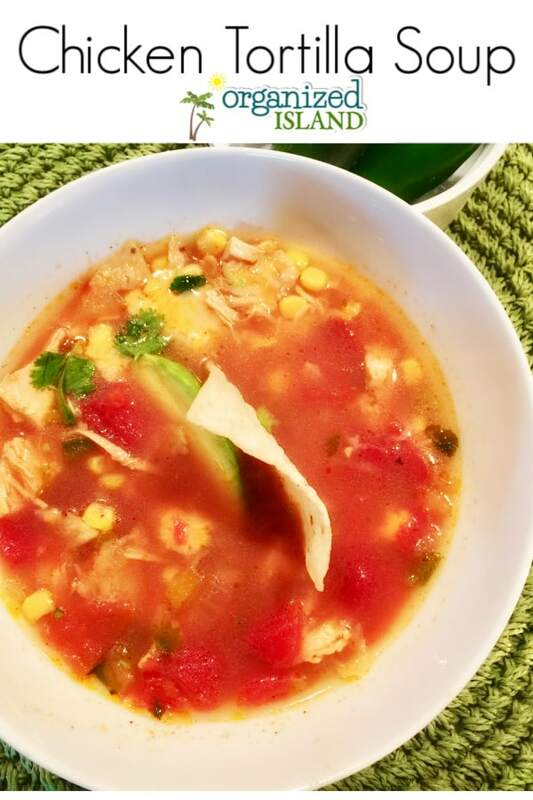 This soup can be made ahead as long as you don’t add the tortilla chips, cheese, and avocado until serving. If you try this recipe or any other recipe on Organized Island, please don’t forget to rate the recipe and let me know where you found it in the comments below, I love hearing from you! Also, let’s connect on Instagram and let me know you found me from the blog. It would bring me much joy! What kind of soup do you like to warm up with? My family likes a little spice, and this looks delicious! Thank you Ginny – we love little extra heat during the winter! Oh, this soup sounds perfect for chilly days! 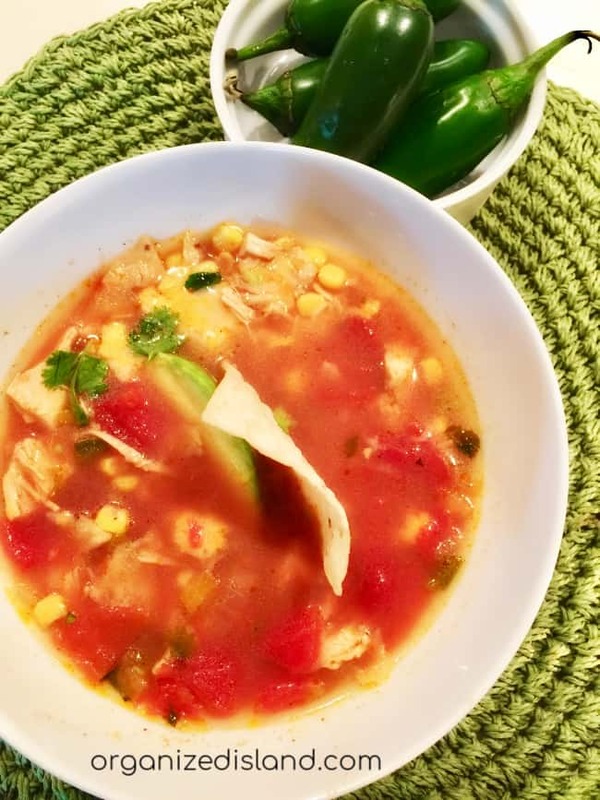 Chicken tortilla soup is one of my favorites — I could truly eat it every day! This looks just perfect for my dinner tonight! It’s delicious Marcie! I hope you try it! This is one of my favorite recipes. I’ve never tried to make it myself, but I love the idea of it for a cold day. Or any day, really. So true Tamara, it is really good for any day!